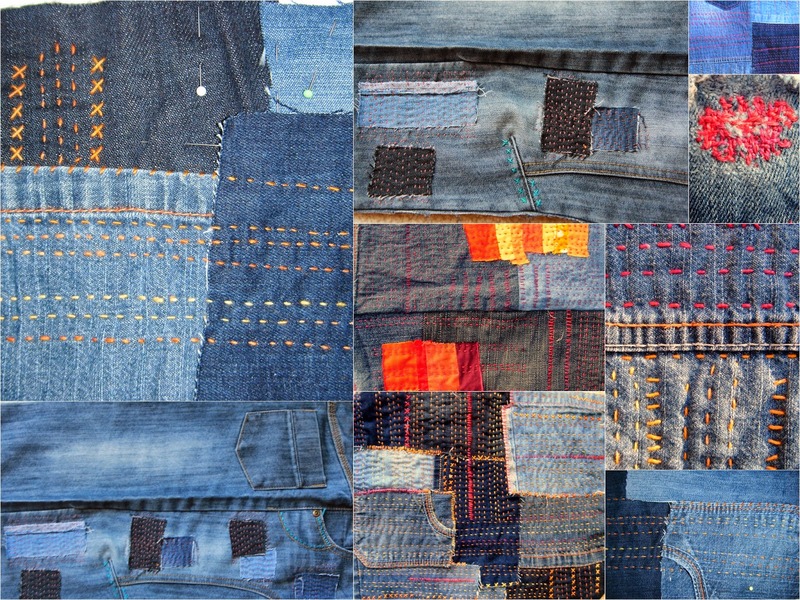 This weeks update on my hand stitching: Little Elephant is making progress - I think I'm somewhere between a third and a quarter of the way through, and the denim bits are piling up. This week's piece has less stitching on than some of the others, and I don't like this thread as much, but I've unearthed a box full of old embroidery threads so will be going brighter again next time. I like the look of the little denim patches though, and will spend this week working on the other half of this. and the old fashioned way (crawling around on the floor). Now that I've started I will keep playing around with this, but if I'm going to think about piecing them together I will definitely need either to do a load more or to find a way to bring something else into the mix. Food for thought, but I'm in no hurry. Linking with Kathy's great Slow Sunday Stitching. Always in love with this project. What a fabulous project! It's looking great. This is a great project! Love the use of different colored threads! A wonderful way of allowing creative energy to develop the project! I enjoy watching this project progress. It must be fun working in conjunction with your sister. (My sisters aren't crafty) I'm a floor crawler too. What a lovely thing to do with your sister! Neither of mine know one end of a needle from the either - total rubbish! I'm with you, samples have to be used - and I'm really excited to see what you do with yours, these are so exciting Kaja! Keep em coming! I was wondering what you were going to do with those denim pieces. I like where you're going with it. Your NY quilt is moving along nicely.